Today, more than 38 percent of Air Force family housing does not meet modern standards and requires either major improvements or replacement. 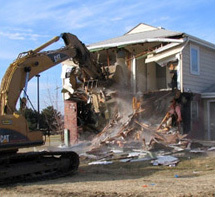 The Air Force is now required to upgrade all inadequate housing by 2011. To accomplish this mandate, the Air Force has launched an aggressive program to revitalize military housing units through a combination of traditional military construction and privatization. Under this model, America First Communities has been contracted to provide for the complete renovation and privatization of Caperhart and Wherry Housing at Offutt Air Force Base in Bellevue, Nebraska. AMI Environmental, in partnership with America First Communities’ development team, is providing the consulting services and hazardous material assessments needed to complete demolition and renovation activities for the entire Offutt Privatization Housing Project. As of September 2009, AMI Environmental has inspected approximately 750 housing units for asbestos, lead, miscellaneous hazardous waste and chlordane. AMI completes final visual inspections following the removal of hazardous materials prior to demolition.